Many people have found their way to Avatar Adi Da Samraj over the past few decades since He formally began His Work in 1972. The stories of how they found Him are moving and often extraordinary. From a lifelong spiritual seeker such as former monk, Crane Kirkbride; to a successful businessman like Aniello Panico, who "had it all", and was living the good life, but was also on the verge of committing suicide  their stories tell how they finally found what their hearts were seeking. It was only then that the real adventure of their life in God could begin for real. Here are a few stories from some Lake County devotees. 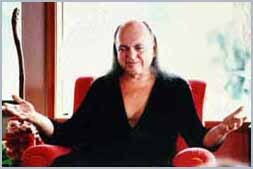 We hope they will inspire you to get to know Adi Da Samraj better yourself! Aniello Panico  In his thirties, Aniello had it all: he was a successful businessman, he had a loving wife and four great kids, a beautiful home, three new cars, and interesting friends. He appreciated good literature, classical music, and the arts. He was living the good life. And he was also on the verge of committing suicide. Aniello tells what brought him to this point, and how he found his Spiritual Master, Adi Da Samraj, in the nick of time. Crane Kirkbride  After years of searching and experimentation in the Hindu tradition, joining a religious order and finding his life still wanting, Crane discovered Avatar Adi Da and the answer to his lifelong quest for Happiness and Self-Realization. Cheech Marrero  In 1967, Cheech Marrero was imprisoned at Rikers Island Penitentiary, awaiting trial for a crime he had not committed. At a plea bargaining session, he was told that if he pleaded guilty, he would receive "only" 20 or 30 years, instead of life without parole. Cheech was at the lowest point of his life. He decided to end it all. Just as he was about to do it, a miracle occurred. Terry Henry  Terry was a longtime successful Christian minister who read Avatar Adi Da's books for years, applying what he learned to his work in the church. All his life experiences, religious and mundane, both high and low, finally coalesced, and led to his leaving the ministry and becoming Avatar Adi Da's devotee. Bill Somers  In the early 1980's, Bill Somers had already realized what he had held to be his life's ambition: to be principal clarinetist in a symphony orchestra. But this accomplishment was not enough for Bill, after all; his heart was not satisfied. And that was a good place to be! It led him to his Spiritual Master. Marvin Carpenter has been a devotee of Avatar Adi Da Samraj since 1975. He is an insurance broker and lives with his intimate partner and teenage daughter. Marvin currently lives in Lake County near the Mountain Of Attention Sanctuary. This is his story of finding Avatar Adi Da. Tom Closser  In December 1983, two months after Avatar Adi Da's arrival at Adidam Samrajashram (on the island of Naitauba in Fiji), an accident occurred that would have been fatal without Avatar Adi Da's Intervention. The story of that incident is told by two people: Frans Bakker, one of the doctors involved; and Tom Closser, the devotee to whom the accident occurred, who describes his near-death experience, and a profound lesson about how "guilt" can become a self-destructive impediment to growth. Annie Rogers  Annie Rogers became a devotee of Avatar Adi Da in 1973. She spent many years serving in His personal Company. Here she tells of how Avatar Adi Da Samraj revealed to her that He is the Divine Person, the "hole in the universe" revealing the Divine Domain. She also realized that the devotee's reception of Adi Da Samraj's Spiritual Transmission does not require any physical or social interaction with Adi Da Samraj: "He Transmits this Power by His mere existence. Just as on the night at Red Sitting Man, I knew that Adi Da does not have to be active. He does not have to look at me. He does not have to speak to me. He does not have to deal with me or Teach me or Instruct me or do anything to me. I knew He is merely That."